A classic puzzle-adventure game that captivates your imagination more than it engages your brain. Myst was one of the first computer games ever to have evoked a true mood, and despite the obvious datedness of the graphics, the absorbing feel of its gameworld still has not lost much of its luster. That's good news for Myst, because frankly the puzzles at the game's core were a bit overrated. I solved more of them through trial and error than any exercise of intellect--the controls are so rudimentary that the only solving mechanism available is clicking on things in the right order. The most satisfying puzzles in the game are so logically constructed that you can actually figure out what the right order must be before trying it. Unfortunately, many others involve randomly diddling strange devices just because they happen to be there and you happen to have a mouse cursor. The plot is rather minimalist, too, and I lost interest in the gameplay on several occasions. Still, Myst handles a first-person viewpoint better than any adventure game before or since; you get to use the clues you discover (or fail to discover) to make game-affecting judgments about the trustworthiness of the NPCs you encounter, the set design is on par with an A-list science fiction movie, and there's that haunting, otherworldly feel. Myst was a classic, a game that has profoundly influenced the past decade of game design (and largely for the better). There are games out there that will exercise your mind a lot more than Myst does, but games that exercise your imagination this much are few and far between--and the handful of truly memorable puzzles Myst does serve up should be enough to bring cheer to even the crankiest of puzzler gamers. 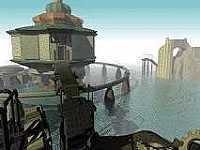 Style: Myst is a first-person puzzle-adventure game with a rudimentary point-and-click interface. The game is untimed and no manual dexterity is required. Combat and leveling are not elements. Series: Myst is the first game in a trilogy (the other two being Riven and Exile). The 'plot' overarching the three is poorly done and of little importance, so it doesn't really matter which order you play them in, but the graphics and interface do improve from game to game. Finding Myst: Because of Myst's great popularity (it ended up being one of the best-selling computer games of all time), finding a working copy is not as difficult as you might normally expect for a title from the 90's. A slightly updated version of Myst has recently been bundled together on DVD with its two sequels, Riven and Exile, so you can buy all three games for a very reasonable price (the DVDs work on Windows and Mac alike). You can also buy Myst by itself in CD format. You can even get versions of Myst for PlayStation or Nintendo DS if you so desire. Getting Myst to Work: Myst is more than fifteen years old now, and like most games that age, it has its share of compatibility issues. 1) The original Myst CD doesn't work very well on XP, but the recent DVD version solves that problem. Buy the DVD's if you're using XP or Windows 7. 2) Windows Vista cannot handle most games released before 2007, and the Myst games are no exception-- you'll need to run a Win98 simulator to run Myst or Riven on Vista. 3) You may still encounter periodic game crashes, so save often. Hints For Myst: I have a page of low-spoiler Myst hints up online, which makes some gameplay suggestions and helps point you towards any parts of the game you might otherwise have missed. If you're stuck on a puzzle, there is a really good hints page at UHS which reveals only one hint at a time, so you won't accidentally learn the answers to future puzzles while scanning for the one you're stuck on; or if you prefer, you can buy a Myst Hint Book. Pitfalls In Myst: There are no subtitles and several puzzles require audio to solve, including remembering annoying sequences of notes and playing them back later. Not a game for those with hearing problems, bad speakers, or noisy children in the house. Game Length: 25 hours, about what you'd expect from a puzzle-adventure. Age-Appropriateness: This game is rated E (for everyone 6 and up) and has nothing objectionable in it whatsoever, though I'd think it would be too difficult and too frustrating for young children to play without a parent. Plot and Quests: Myst does have a plot, and it's interesting and coherent enough not to be a liability, but not much more than that. Very little happens in this game, and the plot never really rises above a vaguely plausible reason for moving you to new puzzle locations. Puzzles and Mental Challenges: Puzzles are clearly the meat of Myst, and there is an excellent variety of them in this game, but few of them made me think very hard and several seemed to be solveable by simple trial and error. There were some memorable spatial and logic puzzles thrown into the mix, though. Characters: You don't have a character of your own. This isn't necessarily a bad thing, as it lets you play the game as yourself and adds to the immersiveness of the experience. On the other hand, the handful of NPCs are boring and you only interact with them by reading about them for the first 90% of the game; combined with the fact that I had no in-character connection tying me to him, I really found it impossible to care about Atrus. Gameworld: This is the true strength of Myst: its eerie, haunting web of worlds makes it genuinely fun to play despite its other flaws. The only reason I didn't give it a perfect score is the lack of logical integration of some of the puzzles--occasionally you feel like you turn a corner along a forest path and there's a pointless contraption sitting there for no particular reason. Gameplay: The gameplay of Myst can be repetitively simple. Basically you move from screen to screen until you find the right puzzle to do next, then click the mouse to move the pieces on each puzzle until you have solved it. Interface: The interface is simplistic but ok. Movement has been significantly improved in the Myst Masterpiece edition. There are no inventory issues since you have no inventory to speak of (you can only have one object at a time). Ambience (Graphics, Sound, etc. ): The graphics look pretty dated by now, and the slideshow presentation comes close to painful. However, the mood evoked by the design of the game is extraordinary--the only other computer games I can remember being this drawn into were the Ultima series of the mid-80's. The music of Myst is also very good. Lora's Recommendations: Myst is a flawed and dated game in many respects, but it still feels more immersive than most games on the market today. I recommend it for anyone with a love of classic computer games, or for modern gamers with a healthy store of patience. If You Loved Myst: Then it's probably worth your while playing the rest of this series. Riven has better-integrated, cleverer puzzles than Myst and a truly breathtaking set design, but its plot is so intensely boring that it took me six years to motivate myself to finish it. Exile is just the opposite, a slickly produced sequel with an interesting story and well-acted antagonist but with pointless puzzles and no real sense of wonder. The fourth game, Revelation, is very much a retread, but still has its moments. Unfortunately I don't recommend the fifth game, End of Ages, which was really awful, but you could try out Uru, a weird little spin-off of Myst that was originally supposed to launch an online game or something like that. Those plans fell through, but Uru remains as an interesting take on Myst from a different angle (3rd person graphic adventure). If you're really looking to recreate the sense of magic you felt playing Myst for the first time, though, my recommendation is actually the graphic adventure game The Longest Journey. The puzzles aren't as complex as those in any of the Myst games, but this subtle, mystical epic moved me in ways it's hard to even articulate; there's little action, the gameworld is fascinating, and best of all, the characters truly make you care about them (the way only Saavedro really managed to in the Myst trilogy). For a more detailed critique of the game involving spoilers, plot holes, and impacts Myst could have on the adventure-game genre, please see my Backseat Game Designer page. Enjoy the game!